At Power Clean Systems we pride ourselves on being different from our competition. We do this by providing the very best customer service in the industry and an array of products and services. We are your one stop shop, whether you are looking for a new container, a refurbished cleaning services, DOT certification, parts, or want to schedule a pickup for your used containers, we can handle it all with one call. We are the only provider in the Northwest that provides you all of these valuable options under one roof to keep your business running smooth and effectively. Each unit is cleaned with a high pressure and high temperature clean water process. All accessories are removed, inspected and cleaned separately, then reinstalled before leak testing in order to comply with RIPA and TPSA guidelines. Each unit receives a final internal and external inspection to ensure product materials are certified to meet DOT requirements under 40 CFR 26.17 and 49 CFR 173.29. After being fully refurbished and meeting all PCS quality standards, our containers are then available for purchase at a price much lower than the cost of a new product with all the benefits and cleanliness of our new containers. If we determine that the used container can no longer meet the standards of our certification process, it will be recycled, thus reducing the carbon footprint and waste that each container potentially possesses. We are committed to our environment and our future. We carry only the very best quality new products, with a wide range of to ensure all of your business needs are met. Many containers are suitable for refurbishment and reuse. 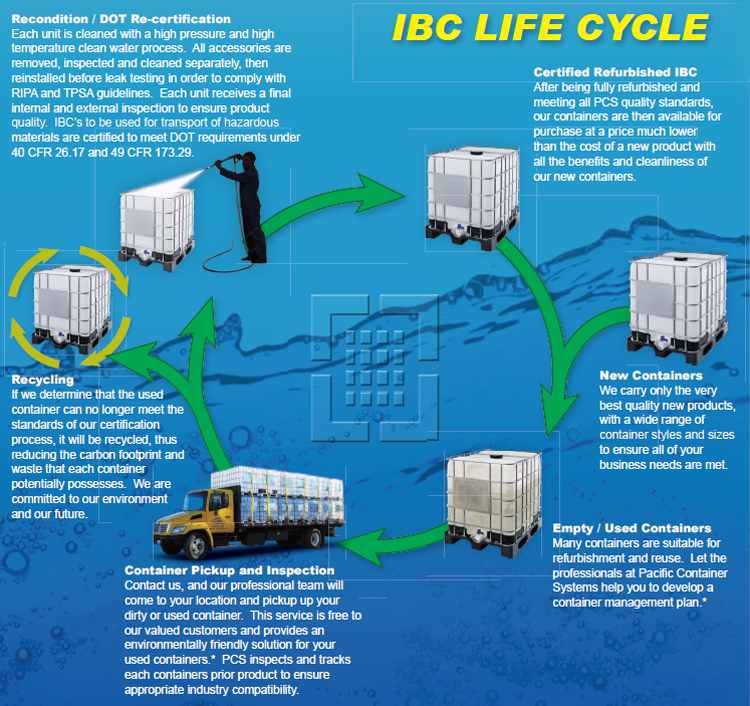 Let the professionals at Power Clean Systems help you to develop a container management plan. Contact us, and our professional team will come to your location and pickup up your dirty or used container. This service is free to our valued customers and provides an environmentally friendly solution for your used containers. PCS inspects and tracks each containers prior product to ensure appropriate industry compatibility. For nearly three-quarters of a century, the Reusable Industrial Packaging Association (RIPA) has been the trade association representing North America re-conditioners, manufacturers, and distributors of reusable industrial packaging. RIPA represents over 90% of the industrial packaging reconditioning industry in North America including many of the world’s leading manufacturers of steel, plastic and fiber drums, as well as intermediate bulk containers. The RIPA membership also includes many of the leading suppliers of packaging parts and accessories. As a condition of membership, all RIPA members agree to conform to a Code of Operating Practice, which sets forth specific guiding principles for operations, packaging, reuse and recycling. These guidelines are intended to improve the industry’s performance in the areas of regulatory compliance, environmental management, waste reduction and recycling. TPSA, founded in 2000, is an organisation of federal, state and local governmental agencies, educational and research institutions, public organizations, private corporations and individuals that are actively involved in different aspects of pesticide stewardship. Stewardship, by definition includes any activity that has a positive impact on the safety and efficacy of pesticides from manufacture, marketing and commerce, through storage and use, and ultimately disposal of unwanted or unusable products and the management of emptied containers. TPSA will serve as a forum to facilitate cooperation among all interested individuals, organizations, agencies and companies.